Join the discussion on our forums! 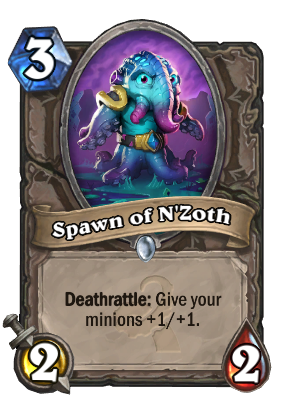 Come discuss Spawn of N'Zoth over in our dedicated Spawn of N'Zoth discussion topic. Mark of the Lotus says hi! OH MAI GAWD LOOK AT THAT CUTE WIDDLE N'ZOTH!!! *Looks at real N'Zoth* WHY CANT YOU BE MORE LIKE YOUR BROTHER?? Hey Blizz! Remember what happened with Anubisath Sentinel? Also, it is way cheaper, so you hace more chances of playing him with other minions or before you enemy has a good removal...so more chances of triggering effect. Zoo needed this to survive, so thank goodness. You're right, zoo is flexible enough to change to suit the meta. And hopefully Warlock is going to get some more cards to help that! First deathrattle mass buff? Interesting to ponder, if your opponent has one (or two) on board and your area of effect spell will leave some minions alive... as this guy will buff the remaining minions. He reminds me of Raid Leader, both being 3 mana 2/2s — though this buff is a deathrattle and adds health too. I can see this card being used in decks that like to fill the board, though you can't always control when he'll trigger for you. He'll make a fresh Baron Rivendare a 3/9 for Wild format. They should give him the most terrifying "enter the battlefield"-sound. I think we can possibly see this in the future in Zoo decks ! as it seems now , zoo priest is coming ! The name is supposed to be Spawn of N'Zoth. Blizzard should make a plushy of this little guy, and instead of a flavor text there's a link to the store's website where you can buy one.